Following this beginners guide will allow you to make better decisions when it comes to the secure disposal of the data you print onto photo ID cards, and inevitably reduce the risk to yourself and the business. The aim of this article is to give those responsible for ID card printing a clearer understanding on used card printer ribbon data and the risks it carries. 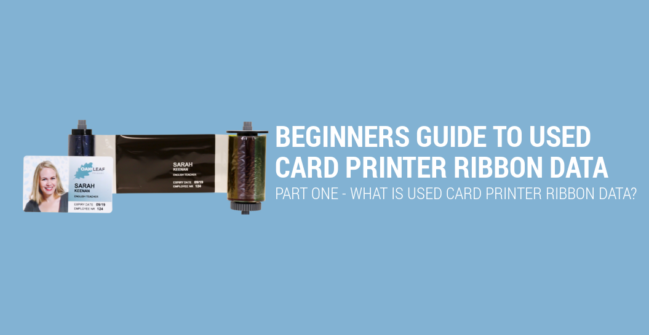 What is used card printer ribbon data and why is it a risk? What is Used Card Printer Ribbon Data & Why is This a Risk? The information you print onto each card is left as a trail on the ribbon. This data is clearly visible and should be treated as sensitive data. This means only authorised personnel should come into contact with this and be responsible for its secure disposal. Due to the new GDPR regulations, every company must now have firm policies in place to protect company and employee data, and these must be visible to anyone and everyone they work with. Whether this disposal is done in house or externally, there must be a clear, legitimate plan in place. Not only could the company be liable to a hefty fine if there is a data breach, but you could also find yourself at risk of dismissal as it was your job to ensure this data remained secure. For more information, download our free guide: ‘The Effects of GDPR on ID Card Printing‘. How do you Currently Dispose of Your Data? With imprints left on used printer ribbons, you should have a strategy set up to dispose of these ribbons efficiently and securely. The same will apply to used or old cards – even if an employee leaves your firm, you are responsible for their data from start to finish. If you throw your used ribbons straight into the bin, you need to stop now. Once this data leaves your workplace, do you know where it goes? Who sees this? What do they do with it? If you do simply throw away your used printer ribbons, please watch this two-minute video as you’re probably breaching GDPR regulations and you’ll need to make some instant changes. One of the most common ways to dispose of used printer ribbons is using a 3rd party confidential waste service. These companies pick up any data you need destroying, including printer ribbons and plastic cards, and take them off to a secure location to be destroyed. For a long time, using a 3rd party disposal service was the most efficient way to get rid of used printer ribbons. 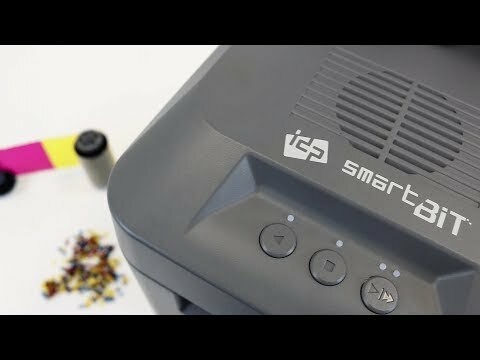 But due to the release of the IDP Smart BIT Shredder, this has caused us to take a look at how effective it actually is. Firstly, data is collected by the waste disposal service and destroyed off-site. This means the sensitive information is still fully intact in transit. If anything happens on the journey to the site, there could be a data breach which you have no control over. There could even be a data breach at the waste service location, and you are reliant on the 3rd party being transparent and making you aware of this. Although the data is taken to be destroyed, it is not entirely secure up until that point. The sensitive data on the ribbons is easily accessible by all and its inevitable that mistakes will be made. Using a confidential waste service, it is a constant expense that adds up quickly and takes time to organise each month. The cost for several months service would easily equal the same amount as a Smart BIT ribbon shredder. Even when outsourcing to a 3rd party disposal service, the company usually comes once a month to collect the used ribbons and for larger organisations with a higher printing usage, this means there will be multiple used ribbons that need to be destroyed by the time they are picked up. These ribbons could even be waiting weeks for collection. This can be a big risk to have in-tact ribbons waiting on-site for anyone to see. The company you use may give you proof of evidence of the destruction, but how can you be sure that these are your ribbons? By using a 3rd party service, there is no certainty to what happens to these ribbons and whether they are fully disposed of. You are letting somebody else be in control of your organisation’s security. The choice is yours, but is this enough to keep you in a job if the data was the source of a security breach within your organisation? If you are using one of the methods above, it might be time for a re-think. It is now becoming more and more apparent that ID card printers need security of their own. What’s stopping somebody from walking up to your printer and simply removing the ribbon straight from the machine? Manufacturers are now releasing GDPR enhanced printers to help reduce security breaches. Not only do they allow you to print outstanding quality cards, but they also come with security features, enabling your organisation to remain secure against a data breach. The IDP Smart 51 Secure takes card printing security to the next level with GDPR enhanced security features, not yet found on any other card printer. The Smart 51 Secure not only has an input card hopper lock to keep printed cards safe but it also has a ribbon lock. This ensures used card printer ribbons remain secure if the printer is left unattended. Nobody can see the confidential data or even get access to the ribbon. Alongside this, it also has a Kensington lock feature that allows you to attach the printer to a desk or piece of furniture, decreasing the risk of theft. This means that nobody could steal the printer or have access to the data left on the ribbon. Learn more about the IDP Smart 51 Secure ID card printer. The Magicard Rio Pro 360 Secure was purposefully built for anyone concerned about the impact GDPR has on ID card printing. It features a lockable input hopper to securely hold blank cards, and a secondary lock to stop the printer being opened. This is where the ribbon and printed cards are kept, keeping them safe and ensuring no unauthorised access is given. Similar to the Smart 51 Secure, the Rio Pro 360 Secure also has a locking port on the base to attach it to a fixed location, eliminating the risk of printer theft. Learn more about the Magicard Rio Pro 360 Secure ID card printer. The Fargo DTC1500 handles security a little differently. The DTC1500 doesn’t have any locking features but the unique resin scramble feature hides important information on the resin panel, making it unreadable. 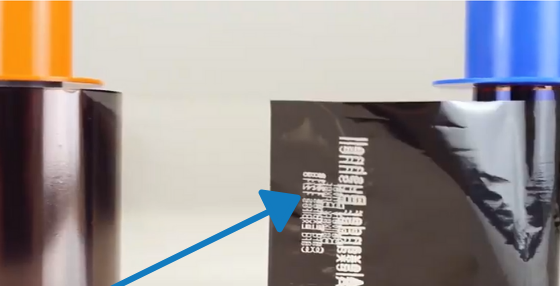 So, for example, if you’re printing a unique employee ID number that needs to remain secure, once printed, the printer will ensure that the data on the resin panel is covered and completely unreadable, as shown below. This means that in the event of the printer being stolen or the ribbon cartridge removed, users still have the peace of mind that their data is completely unreadable. Learn more about the Fargo DTC1500 ID card printer. These three printers ensure data remains secure until the ribbon must be disposed of, but if you want the best solution to instantly destroy used card printer ribbons, the IDP Smart Bit Ribbon Shredder is required. The IDP Smart BIT ribbon shredder is the only printer ribbon shredder of its kind. It provides a secure way of instantly tearing used printer ribbons into tiny unrecognisable particles, eliminating any confidential data left on these ribbons. Compatible with all ID card printer ribbon manufacturers, any ribbon can be shredded, so there’s no excuse for not properly disposing of your ribbons. The Smart BIT takes only 60 seconds to set up and once ready, just press play and the machine does the rest, allowing you to get on with other jobs. The compact design allows you to shred in-house, eliminating all issues involving a 3rd party confidential waste service. It’s that good we had to record a short review video allowing you to see this for yourself. Learn more about the IDP Smart BIT Ribbon Shredder. We hope we have shown you just how crucial it is to take care of these used printer ribbons and how to dispose of them in a proper, secure manner. It’s not worth putting your whole organisation at risk over a card printer ribbon. If you wish to review your current card printer security, or to find out more about any of the printers and machines found in this guide then our team will be happy to help. Please call us direct on 0800 988 2095 or email us at sales@digitalid.co.uk.